Description: Rebel Star doesn't like the Empire and won't miss an opportunity of spray painting the logo of the Alliance, but she is attacked! 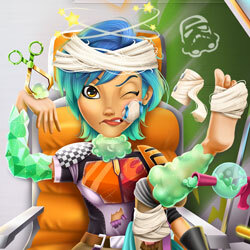 Take care of our heroine in the medical bay and give her the right treatment! You are her only hope to recovery, so pull out the shards, fix the broken bones and she will ready for the next mission.